A workplace project in a new shared working hub in Melbourne’s Docklands, the existing condition was a vacant commercial tenancy with a raw, industrial spirit. 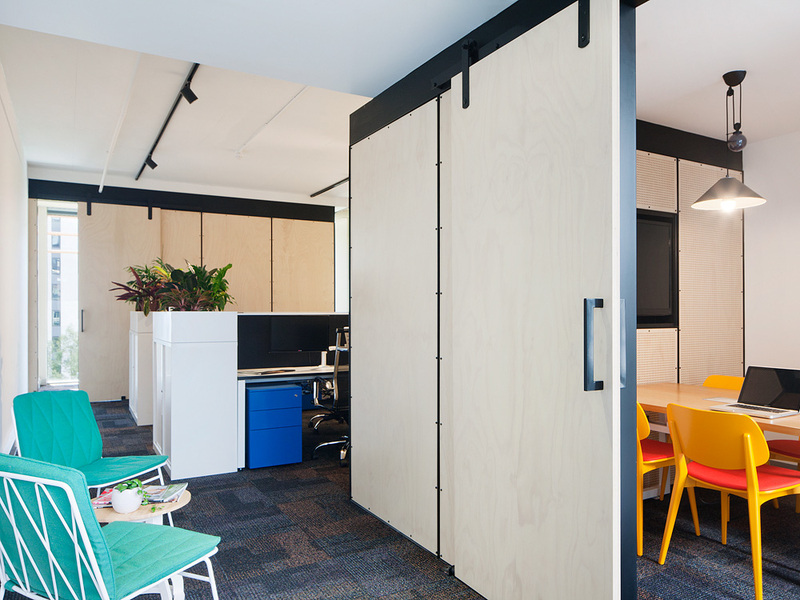 Molecule’s brief was to provide a CBD presence for a new financial planning business, providing two client meeting rooms, open-plan workspace, staff kitchen and a discreet zone for printing and storage. The design challenge was to capture the youthful spirit of the firm and to humanise the space while enhancing its industrial spirit; our zen-inspired design response contrasted the warmth and softness of plywood panelling with the mechanical precision of expressed fixings and door hardware. Against this mannered backdrop, highly coloured furniture scenes offer energy, points of focus and moments of whimsy.